We often don’t hear the voice of God when we are serving the voice of busyness. 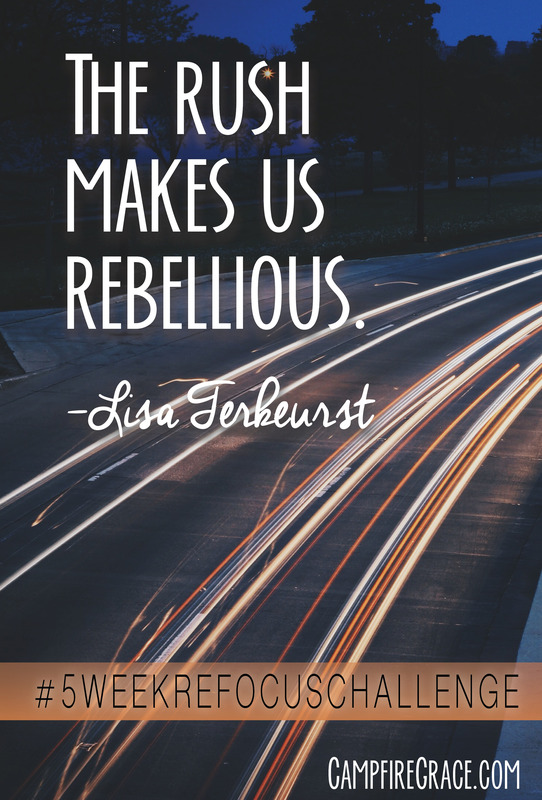 In her book, The Best Yes, Lisa Terkeurst comments: “A woman who lives with the stress of an overwhelmed schedule with often ache with the sadness of an underwhelmed soul.” I plan to reconstruct my schedule to work FOR my best (God’s best), not against my desire to flourish. I’m making room in my schedule to be still with God, spend quality time with my family, and fuel my soul with life-givers. A family friend calls this our “sanctified no” space. Reading Priscilla Shirer’s Breathe has propelled me to factor in margin, or “white-space” in my plans. In my dapples with graphic design, I have learned that white space is one of the most important elements of a presentation. White-space clears out distractions so the focus stays on the main idea of the poster or book cover. In the same way, I believe white space in my schedule will help me focus on the main goals God has for me. White space is not the leftover hours that don’t get filled. I plan to schedule intentional “white space” in my calendar this season. In the next few days, I plan to take inventory of each hour of the week. Is the way I spend these hours honoring God by drawing me closer to Him, and serving in the way He want’s me to serve? (More on this later in the week). This renouncing of clutter can apply to our physical spaces as well as our schedules. Inefficiency is oozing all over our home (and car!). This distracts me from intimacy with God. It provokes ungratefulness and over-accumulation. I’m not using what He’s already provided, and worse, I’m withholding generosity from our wealth of stuff and space. Does anyone else sense this need to unpack the unnecessary? It’s time to retake our space! As with the schedule, taking inventory of each room and closet in our home will generate a grand refocus for our home’s true purpose. For each item and every space, I’d like to ask: is this serving it’s purpose? Some rooms are not arranged to their fullest potential. Some cupboards are not fulfilling the goal of organization. Much of our closet is dedicated to housing unfolded laundry and worn out shoes. I will upcycle, donate, or trash anything that is not a “yes” to the above question. For my clothes, I plan to wear EVERYTHING once over the next month (ok, not my wedding dress). This is the best weather for tanks+cardigans and sweaters with shorts, so I really can wear each item in my closet. If I can’t bring myself to wear a shirt or dress, I will muster the courage to move on by donating it. I must not that retaking our space is different than week 2’s idea of resetting home base. I recommend reseting home base first (perhaps weekly?) before trying to take back the space for it’s best use and efficiency. By initiating a grand take over of our time and space clutter, perhaps we can stimulate a much-needed de-cluttering of our minds as well. I am humbled that you provide such wealth of time, space, and stuff in my life. I am ashamed by my misuse of and lack of gratefulness for it all. Please forgive my poor attitude and lackadaisy. Give me wisdom to embrace each blessing you provide—the time in my day, relationships in my life, and the stuff in my home—and honor you with it! Tuesday: Figure out what immediate things tend to steal your attention from the important (these might be similar to time-wasters). Set a strategy to ignore them. Wednesday: Take a hard look at your schedule. Is there any breathing room? Any quiet time? 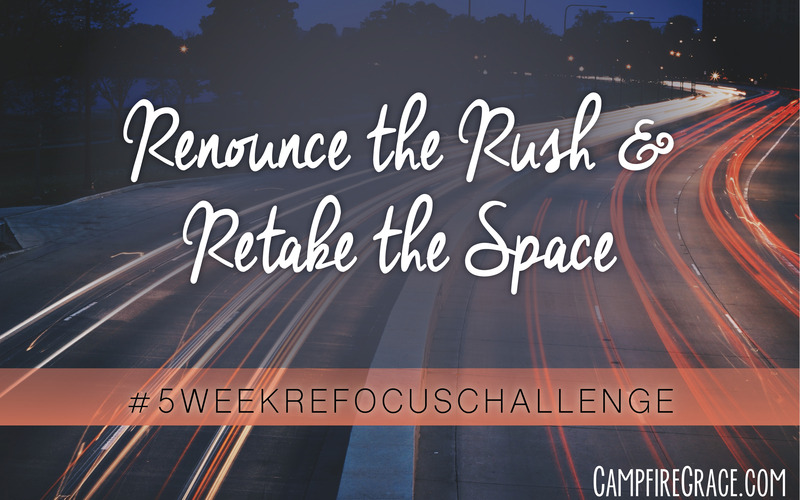 Write down any distractions and pray about how to renounce the rush. Thursday: Unpack the unnecessary in your home. Make a list of each room (each closet should have it’s own line item). And brainstorm ways to conquer the list a little at a time. Friday: Check back here to Redesign your Schedule. How do you plan to de-clutter your schedule or your space?